Hi guys, today I’m going to talk you through my latest makeup removing routine. As I mentioned previously, I have stopped using facial wipes to remove my makeup as they can be quite harsh and most do contain alcohol which is not very good for your skin. 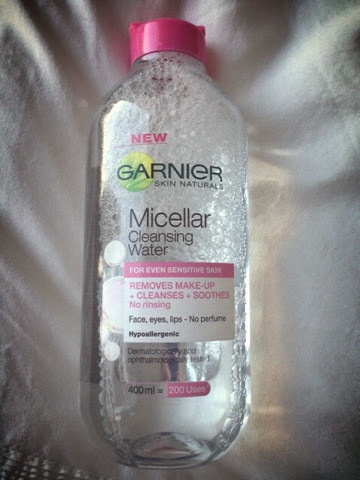 I have enjoyed looking for more ‘skin friendly’ makeup removers and having tried La Roche Posay's Micellar water, I thought I would give the Garnier one a try too. I thought it would make a good 'high end' v’s 'low end' comparison and also, at a complete bargain on offer at £1.99, even if it turned out to be rubbish at least I wouldn’t have thrown good money away! I have to admit I am a total sucker for good packaging and I was drawn to the pretty bottle with a pink cap. The whole product looks clean, fresh and very appealing. After using La Roche Posay's Micellar water and realising how much of the product I used in one sitting, I found the bottle didn’t go very far and after about two weeks I needed a new one. In comparison, the Garnier Micellar water contains 400 Mls and claims to have enough for 200 uses. That’s great because I tend to use quite a lot, I like to make sure every last scrap of makeup is removed before I go to sleep! Micellar water, (just in case you’re not sure exactly what it is) contains a mixture of natural spring water with surfactants which work brilliantly to lift excess oils and makeup away whilst being extremely gentle to your skin. Unlike many makeup solutions out there, Micellar water doesn’t tend to contain any ‘nasties’ or chemicals which could irritate your skin. I tend to go by the rule that if you can’t pronounce one of the ingredients, then it’s probably not very good for you! Haha! Anyway, I give this product a great big thumbs up and will definitely repurchase this once I’m through this bottle. It not only removes full coverage makeup with ease but also leaves my skin feeling as though it’s been thoroughly washed too. I like to wash my face after removing makeup anyway but this product makes me feel like I already have! I hope this helps anyone looking for a great and affordable makeup removing solution!